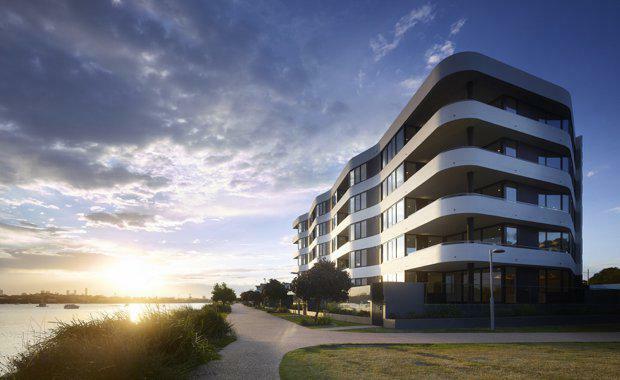 One of Frasers Property Australia’s signature apartment projects, Newport, has settled riverside to provide luxury living only six kilometres from the city’s CBD. Newport comprises 34 apartments - 25 three-bedroom apartments and nine two-bedroom apartments and was designed by Rothelowman to deliver the highest levels of amenity to owner-occupiers. “We are extremely proud of this stunning project which is a culmination of innovative architectural design,” Frasers Property Australia General Manager Cameron Leggatt said. Rothelowman's task as project architect and interior designer was to integrate the project into the surrounding public domain including parklands, the river and a pedestrian pathway network. Nestled between the Brisbane River and a vegetated waterway, Newport adjoins the Royal Queensland Golf Club. Rothelowman Principal Jeff Brown said these natural elements shaped the site into a triangular land parcel secluded from the street. 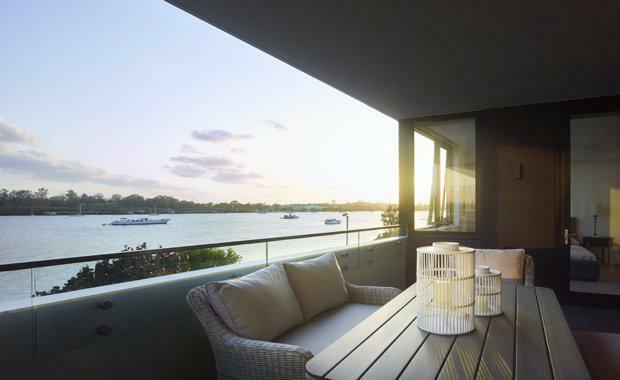 “Defined by a splendid location next to the Brisbane River, golf course and waterway, we were given the opportunity to deliver a high-quality, private and intimate apartment dwelling, very favourable to an owner-occupier buyer,” he said. Design inspiration for Newport came from the aspiration to deliver an aesthetic experience matched to liveable spaces that are the equal of their location. “The building was designed to mimic the movements of the Brisbane River; white and dark tones fold against one another, allowing for deep shadows to play across the facade to exaggerate form and movement,” Mr Brown said. “Large panels of patterned precast concrete were derived from early sketch studies of the adjacent mangrove undergrowth. The interior layouts of the apartments were deliberately kept open and fluid to celebrate the outlook and its abundance of southerly and easterly light, which reaches into the depths of the spacious apartments. “The interiors of Newport showcase a lightness of finish and simplicity of detail that allows owner-occupiers to really personalise their own apartments,” Mr Brown said. Apartment features include ducted air-conditioning, double glazed windows, built-in Vintec wine fridges, chef-style kitchens and large entertaining balconies. “The building’s location, coupled with the spacious layouts and high architectural quality deliver a logical and considered manifestation of the desired lifestyle opportunities available in the precinct,” Mr Brown said. Frasers Property have also worked with Rothelowman on the design of their next boutique release, not far from Newport, delivering riverside homes for the absolute top end of the market, which will be launched later this year. “We have been working closely with Frasers Property on a project which is set to become their most prestigious development in the Hamilton Reach masterplan,” Mr Brown said.